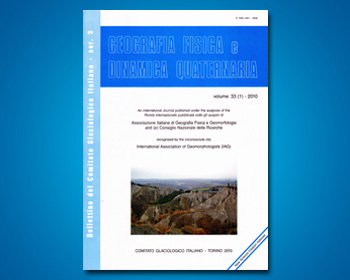 A geomorphologic and morphometric analysis was performed in order to determine the characteristics of the de La Ciénaga river basin, an arid mountain river basin located in the southwest of San Juan Province (31°45´S, 68°50´W), Central Pre-Andes, Argentina. The drainage networks were derived from shuttle radar topographic mission (SRTM) data, satellite imageries (Landsat TM and Spot image) and field works. The paper also addresses a preliminary evaluation of the flood hazard responsible for severe damage to farming and infrastructure in the downstream region. The study basin area covers almost 700 km2, comprising five sub-basins, ranging from 111.96 to 159.30 km2. The asymmetrical morphology of the basin, neotectonic features and the diversity of alluvial deposits found along the de La Ciénaga river basin show that it is in an active tectonic environment with strong lithological and structural controls and a marked tilting. One common feature to all analyzed sub-basins is their elongated shape, which allows a rapid concentration of water that intensifies the power of the flash floods. The drainage network in the different sub-basins has, in general, two predominant patterns; one is parallel to sub-parallel to the headers and foothill areas; and the other, in the piedmont zone, is divergent. Zonda valley, located downstream of the basin, is affected by flash floods coming from the mountainous area.